I have created a new page for the dojo called the "Donjitsu Do Dojo Neighborhood News" page. It is connected to or dojo Facebook page. I would like to urge everyone to check it out, like, share, and utilize this new page to transmit important tips and information to friends, family, and neighbors. This page is to transmit safety tips and local events that are happening in our community. Even if you have friends and loved ones who are not interested in martial arts but live in the area surrounding the dojo, please share this page with them so we can get the information to them as well. If you have any questions or helpful comments please let me know. We have a couple of spots available in our kids class. Due to the limited amount of student that sensei wants in each class these spots are not often available. The starting age is 6 years old and classes meet from 6pm to 7pm on Mondays and Wednesdays. If you are looking for a someone to entertain your child or a babysitter this is not the place. 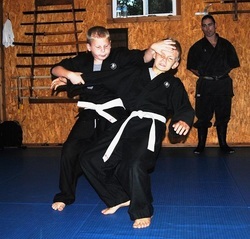 However, if you are looking for a place for your child to learn life and coping skills, how to become more aware and how to actually defend themselves we can help you. This post will be taken down once the class is full. For more information please contact Sensei Ogle 864-895-7773 or click the button below to send and email.